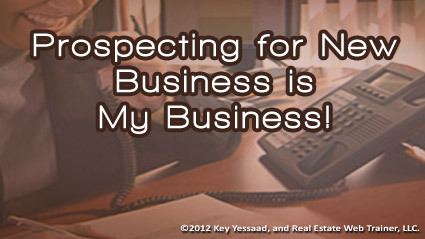 November and December are good prospecting months! Hibernation in the Real Estate Business this time of year is rampant; yes the number of deals agents work on dwindles, which means it is the perfect time to prospect for listings for the coming Spring. Have you identified your Farming Areas? Have you setup your door knocking schedule? Have you designed your mailers to your database? Have you reviewed your marketing material, from Business Cards, to local print, to craigslist postings? Have you blogged your services and solutions? Have you identified past clients to call and generate leads from? There is fundamental truth in Real Estate that only the pros understand deep in their gut: ‘No matter how long you have been in Real Estate, or awards you have won; when your prospecting work slows down so does your income!’ Prospecting is not difficult but getting started mentally and gearing for it is most challenging at the beginning; it is a habit like any other – learn to prospect and you Real Estate Business will always thrive!